There are many great reasons to scuba dive, but the one that most captures people’s imagination is marine wildlife. From schools of tropical fish to sharks, tropical seas house an impressive chunk of Earth’s life that most people only ever see on the Discovery channel. Still, as a diver, I firmly believe that swimming with a school of fish or sharing a manta ray’s habitat for a few minutes is about more than recreation. Seeing the ocean animals in their natural habitat makes them seem more real and worth protecting than any TV program could. 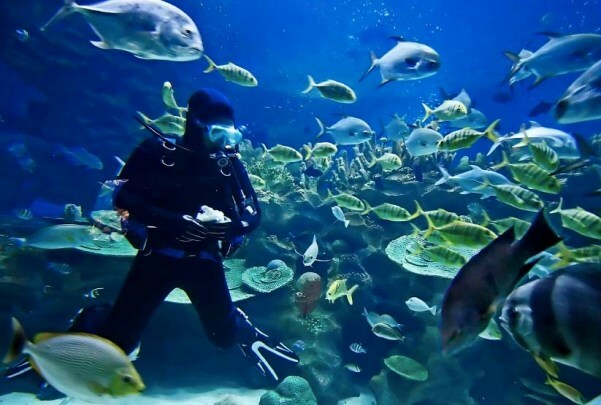 At each of these five incredible destinations, divers can get up close and interact with some of the planet’s most powerful and beautiful animals. The action is just below the surface at many of these sites, so even novice divers can participate. 1. Palau – There are a whole host of good reasons to dive in Palau, a tiny island nation in the south Pacific. The islands have been famous as a wreck diving site since 1969, when Jacques Cousteau came to Palau’s Chuuk Lagoon in 1969 to film the wreckage of Japan’s Pacific fleet, most of which sunk there during World War II. The wrecks have since been colonized by a variety of marine life that includes corals, rays, turtles, and over 200 species of fish. Above all, Palau is known for it’s sharks, with some 130 threatened species inhabiting the islands. To protect the islands’ ecosystem, Palau’s government in 2009 named the country’s waters a ‘shark sanctuary’, banning all commercial shark harvesting. Divers are likely to run into grey reef sharks, whitetips, and other species patrolling both wrecks and wall sites like Blue Corner.